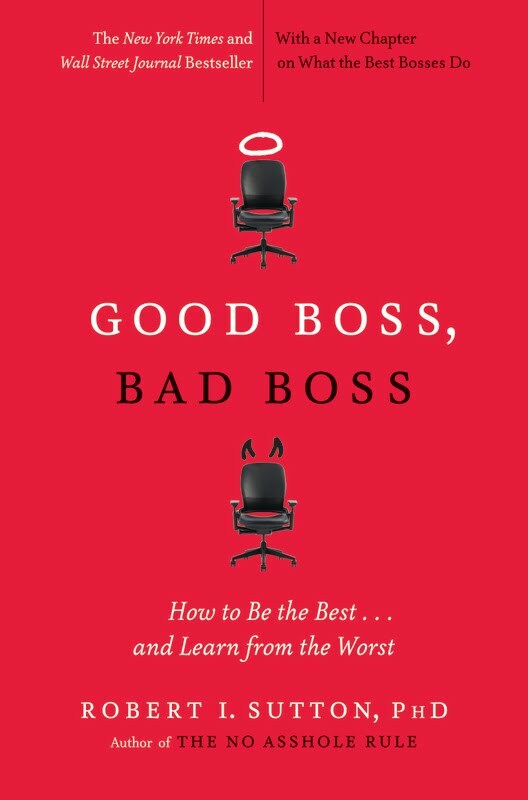 Bob Sutton’s book Good Boss, Bad Boss, is out in paperback. If you don’t own the book yet, now would be a great time to buy it and start digesting Bob’s evidence-based advice. I reviewed the book here back in July of 2010, and Bob was gracious enough to answer a few questions I had about the book in a separate post in September of 2010. Sutton is one of my favorite management thinkers, and I highly recommend any of his books. The paperback edition contains a new chapter at the end, an epilogue with nine lessons he has learned over the years about good and bad bosses. The first of these nine lessons is “Assume you are clueless, insensitive, and selfish – especially if you wield a lot of power or your people are performing especially well” (p. 255). The second lesson is “the definition of a great boss (or leader or manager) does not need to be reinvented” (p. 259). We humans still yearn to follow others who are competent enough to bring in resources, teach us new skills, and generate attention and prestige from key outsiders – who drive performance. We also want fair leaders who protect us, and how make us feel cared for and respected – who inject humanity. Although the ways bosses accomplish these things is and always has been constrained by technologies, culture, different kinds of work, and on and on, the fundamentals remain unchanged. (p. 261)…As over fifty years of research shows, treating employees with respect, encouraging them to participate and make suggestions, and listening to them are as important as ever. (p. 263). The principles of good leadership really are that simple to understand, but they are not easy to master. For most of us, it takes a lifetime of determined learning. What do you think? Please share your thoughts in the comment section below. Why UNR Online Executive MBA? Posted on February 29, 2012, in organizational behavior and tagged leadership, leadership development. Bookmark the permalink. Leave a comment.